In paying tribute to DC's 75 year history, IADW will be going behind four of the best DC fan-sites on the internet, to find out about the passions, dedication, and people behind them. This week; Robert J. Kelly, the driving force behind such great comic sites as Treasury Comics, and the focus of this interview, The Aquaman Shrine. 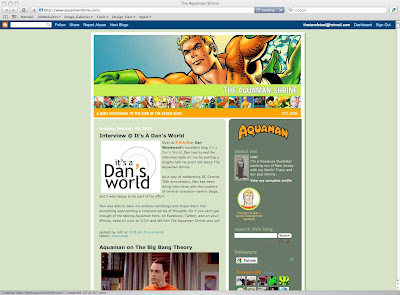 IADW: For a iconic hero who doesn't currently have his own title, Aquaman sure has one monster of a fan website in The Aquaman Shrine. The sites masthead says it all 'A daily devotional to the King of the Seven Seas'. What was it about the character that made Aquaman such a fan favourite with you? Rob: I remember watching the Super Friends when I was a wee lad and I always gravitated towards Aquaman. Maybe it was something about the colors of his costume (he really stands out), or his powers, the fact that he looked the most like me (blonde hair, stunning good looks). Then when I started reading comics, I took to his stories almost immediately--both in the pages of his solo book and in JLA. IADW: You don't just do The Aquaman Shrine, with over half a dozen websites in your care, how do you manage to keep up the 'daily devotional' and keep track on Aquaman wherever he may surface? Rob: Well, I am VERY fortunate to have a veritable army of Aquaman fans who send me stuff (literally and virtually) which keeps me and the Shrine up to date. I couldn't do it without the other Aquaman fans--I would've run out of stuff ages ago. When I started the Shrine up in 2006, my intention was to show off my then-Aquaman collection and I figured it would run a year or so, tops. But as people's enthusiasm for the Shrine grew, I decided to expand the blog's scope to the point that it covers every instance of Aquaman, everywhere. PICTURED (Left to right): Legendary writer, Steve Skeates and iconic artist, Jim Aparo are the key creators for Rob in Aquaman's history. IADW: On that note, I find there's a different kind of passion in the fans of the 'next row back' then there are of the supposed 'major players'. With the fans in mind, one of the defining differences of The Aquaman Shrine, is the creation of F.O.A.M. (Friends of AquaMan), an online community of Aquafans on the net. What was it that inspired F.O.A.M., and how do you feel about the life it has taken on? Rob: FOAM was a total off-the-cuff idea. A friend named Chris Franklin sent me a photo of the 1966 Ideal Aquaman figurine he owned, because I had just done a post on mine. His had a slightly different paint job (and the same defect--a broken-off knife) so I thought why not post the pic? I wanted to thank Chris in some way, so I just decided to call him a Friend of AquaMan--FOAM. Very quickly, people took to that and started sending things in to become a FOAMer, too--it really took up a life of its own. After a few people had acquired that designation, I made up a little certificate I would email people as a way to say thanks. Once people heard about that, the FOAM thing exploded. It's incredibly rewarding people seem to want to be part of this silly little club--I always worry that some people are disappointed when they see its just a little thing I email them, it's not like being a member of FOAM gets you a discount at a seafood restaurant or anything. But people really seem to love it. It shows how much you can inspire people to follow you if you make even a token effort to make them feel like they're part of it. IADW: With that 'community' taking on a life of it's own - what characteristics define a F.O.A.Mer to you? Rob: One of the things that I think drives Aquaman fans is that Arthur is so put-upon. I'm not in ANY WAY disparaging, say, Superman or Batman fans, but if they're your favorite hero, there's no real perception to fight against, you know? No one's going to shrug and say "Eh, Batman, he's lame"--the guy's about as iconic as it gets! But people who love Aquaman, often as not, have to defend that love--even among fellow comic nerds. And I think that's something that the Shrine accidentally tapped into--that feeling that people, if they knew better, wouldn't be so dismissive of the character. The other thing I love is how upbeat and polite the Shrine crowd is. There are a lot of blogs I go to where the readers get really out of hand, hurling insults and stuff like that. But in all the years I've been running the Shrine, I think I've had to delete something like three or four comments, which is amazing. My attitude when talking about stuff is to praise what I like, and ignore the rest (for the most part). I'm glad to see that generally-positive attitude has been able to be maintained. IADW: Aquaman seems to be a fan favourite with many top creators as well. Now more than ever The Aquaman Shrine is sharing in that success, by interviewing the likes of Batman: Brave and the Bold Producer, James Tucker. How does this level of recognition feel? Rob: The interviews are probably my single favorite part of doing the Shrine. Not only does it reflect well on the Shrine itself, but its been very rewarding to have the chance to tell someone directly that I love their work. As a kid, I didn't really write letters to comic books, so my love for the work of certain artists and writers remained unspoken. In addition, I've become friends with some of these people, people who I sort of grew up reading, and that's just amazing to me. I feel very lucky that so many people have been so generous of time and spirit with me. (In particular, Paul Kupperberg was an early booster of the Shrine and helped connect me up with other people, and is always willing to answer questions I have, even if its not for a proper interview. If the Aquaman Shrine has a Godfather, its him). 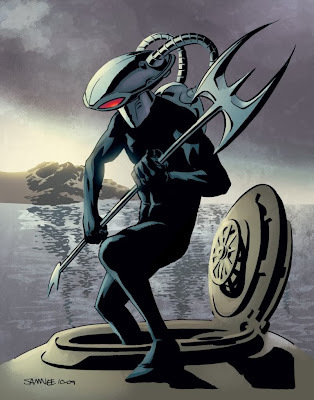 PICTURED Of all the Aqua-rouges it is the violent Black Manta that Rob feels best puts Arthurs heroisim to the test. IADW: Who would be your dream interview? Rob: Well, obviously, I wish I had started the Shrine earlier and had the chance to talk to Jim Aparo. I'm lucky enough to have an original Aquaman sketch by him, but it was given to me as a gift so I never actually met the man. I wish I could've told him how much I loved his work and how much it still means to me. Same thing with Neal Pozner, writer of the 1986 Aquaman mini-series. I absolutely loved that series, and I thought if Neal had continued writing the character, Aquaman would be an A-list character, and we wouldn't be talking about yet another Aquaman re-launch. IADW: Speaking of exploring Aquaman's rich history, every Sunday you post pages from some of Aquaman's earliest adventures in More Fun Comics. Have these 'year one' stories made you see Arthur in a different light, and what do you feel is the core of the character, that has seen him last for close on 70 years? Rob: There really isn't much of a through-line between the Golden Age Aquaman and the one currently munching human flesh today. The More Fun stories are much more formulaic, and the characterization is almost nil. That said, there are elements of the Golden Age Aquaman I wish the current version had maintained a bit more--the sense of fun, the craving for adventure--ironically, those are the very elements on display in the Brave and the Bold version of the character, which is enormously popular. If there's a "core" to the character, its his devotion to the sea and sea life. He is unique among superheroes that he has this one (huge) area that he sees as his duty to protect. I love that aspect of him, and as an ardent animal lover, I think that might be the part of the character that connects me the most to him. DC used to do--and still does, occasionally--a lot of PSA-type comics (you even did a post on them), and with Global Climate Change being such a big issue nowadays, I think DC is missing a bet not having Aquaman headline a series of that type of comic, teaching kids about GCC and the environment in general. He's the perfect ambassador for that type of story. 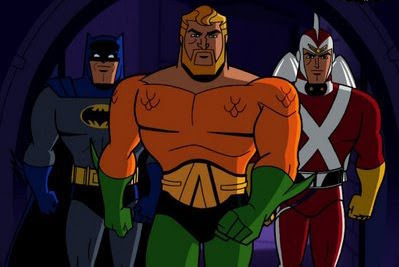 PICTURED A frequent guest on animated series Batman: Brave and the Bold, Rob feels this is Aquaman's best out of comic experience. IADW: Every character has his weakness with fans, and for Aquaman it is the 'he's the guy that just talks to fish' syndrome. What do you have to say about Arthur, that may get people of that perception to give the King of the Seven Seas another shot? Rob: I'd say, as has been proved time and time again, there really aren't that many bad superhero characters, because a gifted writer can do wonders with them (I'm old enough to remember when the X-Men weren't even regularly published because they didn't sell!). 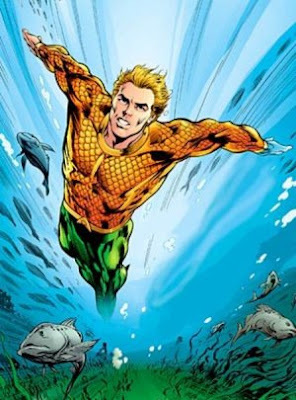 Aquaman, unfortunately, has been the victim of benign (and sometimes not-so-benign) neglect from DC Comics, and there are a whole bunch of fan favorite writers (J. Michael Straczynski, Geoff Johns, Mark Waid, Brian Azzarello) who think Aquaman's a great character, someone they'd love to write. What does that tell you? Aside from that, shorter advice if there's a new Aquaman title: BUY! BUY! BUY! IADW: Spreading the word of Arthur is something The Aquaman Shrine does well. With two related Facebook pages, video clips, an Amazon store, Twitter, even it's own iTunes application, the Shrine is literally becoming the multimedia touchpoint for the King of mythological Atlantis. How does it feel to be riding the wave of technology, through such varied ways? Rob: Its great, I love making the Shrine THE place people think of when they see Aquaman, and now its presence isn't limited to the blog itself. I grew up and went to art school just before computers and the internet became the standard, so its amazing to have all these efficient ways to communicate. I can have an idea, put it up on the Shrine or on Facebook, and sometimes within minutes someone has heard about it and is running with it. Case in point: after someone first told me Aquaman would be in Brave and the Bold #32, I wrote about it on the Shrine. A few minutes after that, I got the idea to try and interview B&B's writer, J. Michael Straczynski. I found him on Facebook, emailed him, told him what I was trying to do. Less than an hour later, he emailed me back. By the end of the night, I had sent him the interview questions and by the next morning, he had written back and I had the interview ready to go for the following Monday. This whole B&B #32 effort went from first idea to finished interview in less than 12 hours. 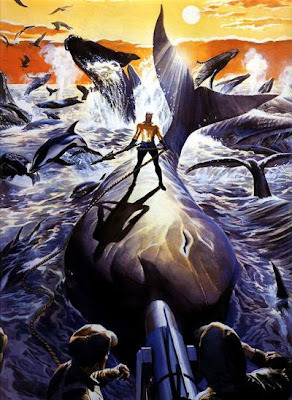 PICTURED It's this image of Aquaman and a few thousand of his close personal friends, by iconic painter Alex Ross that Rob feels is the defining image of his hero. IADW: What hopes do you have about the future of the character, and for The Aquaman Shrine? Rob: I think, given the character's familiarity with the larger, non-comic-book-buying public (which is pretty much the world's population minus around 500,000 people), there's no reason why Aquaman remains such an also-ran in the world of comics. In 1986, Wonder Woman, in terms of the comics, was about in the same place as Aquaman is now. But George Perez--then at the top of his game--came in and took over the book, and stayed with it for, what, three or four years? It gave Wonder Woman a consistent feel, and people (like me) started reading the book when we never did before. And even though Diana has had some ups and down since then, I'd say it was Perez who put Wonder Woman back up top where she belongs. With Aquaman being so visible nowadays (Brave and the Bold, DC Super Friends) there's no reason why the same can't be done with him. Geoff Johns has done some great things with Mera, so a book with Classic Aquaman and Mera again? No reason why that can't be a winner. As for the Shrine, I just want to, as Bob Dylan once said, "keep on keepin' on." The Shrine's audience grows each year, month by month, and that's enormously rewarding. There are some grander ideas I have for it, but until I can make the Shrine my job (Warner Bros., you know how to get in contact with me), I have to budget my time accordingly, so some stuff I want to do remains on my perenennial "to do" list. But who knows? With the small army that is FOAM, I feel like any idea I come up with can happen once I put it out there. No doubt there, and thanks again to Rob for sharing his passion on Aquaman with IADW! The Aquaman Shrine truly is the ultimate resource on the iconic DC hero - so be sure to drop in soon! Next week: Yet another DC fansite pulls back its curtains, and this time we'll be talking team. Rob does an awesome job with the Shrine, in addition to having a 'real life'. His posts showcasing his artistic talent are always fun to see. I know I can speak for all the F.O.A.M. members when I say THANK YOU to him for all he does for Aquaman. Great interview Rob. You are "Da Man" when it comes to our favorite superhero! Finally, our favorite webmaster is in the spotlight. Great interview again, Rob! Thanks so much for all the effort you put into the Shrine and all your other sites. All of us FOAM-ers are proud to be a part of what you have created, and to help in any way we can. Thanks for the comments guys, and once again for your time Rob! Rob does an awesome job with The Shrine, and was great to interview! It's long been one of my favourite online haunts, and as a FOAMer myself, one of the things I was gladdest to see Rob talk about was the positivity of the site. If I could've bolded that line in flashing orange I would have. The Shrine helps lead the way for us 'fan sites' and hopefully this interview will stand as a testament to that! Great site and great interview! Nice site, nice interview, good work!! Thanks Bill and Russell - glad you liked your visit - trip back on over to It's A Dan's World any time!